Our Shabbat luncheons are a wonderful opportunity for all of us to relax and spend time with friends and family. With a $450 contribution to the Kiddush fund, you can sponsor one of our non B’nai Mitzvah kiddushim in celebration of your special occasion. Two or three families can get together to sponsor a Kiddush with a contributions of $300 from each family. Do a mitzvah for the shul and let’s all celebrate your special simcha! Sponsor in honor of a birthday, a wedding anniversary, the anniversary of your Bar/Bat Mitzvah, or in memory of a special yahrzeit. Sponsors will be recognized in our weekly e-blast, from the bimah and in our Friday flyer. Become a Member of the “Kiddush Club”! For a $100 donation, you become a member of the club, and your donation will be acknowledged from the bimah, and, if you choose, your special simcha or occasion will be mentioned in our Saturday Shabbat flyer for all to see. 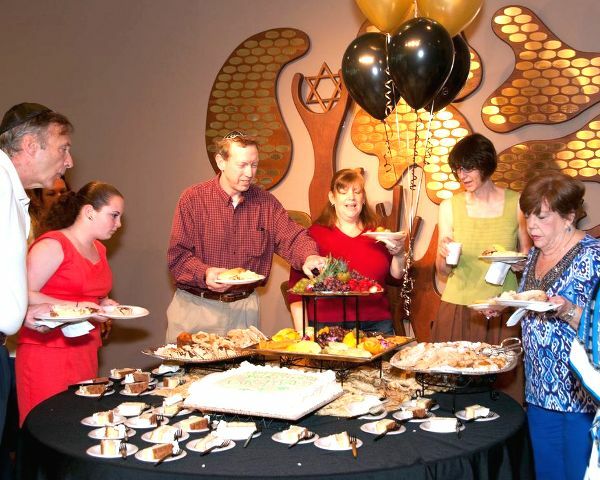 Just think…you can pay tribute to a special occasion AND help support our popular weekly Shabbat Kiddush! To sponsor a Kiddush or to become a member of the “CBS Kiddush Club” contact the Beth Shalom Office at 770-399-5300 or email us.